Today was truely a hectic day. I wasn’t expecting everything to go the way that it did. In the morning things were looking up. I settled into my bosses chair and took to do the work she usually does. It was nice being in control. People started saying how I was going to take her spot. Which maybe one day I will. Later in the day I saw for my own eyes why she was always stressed. 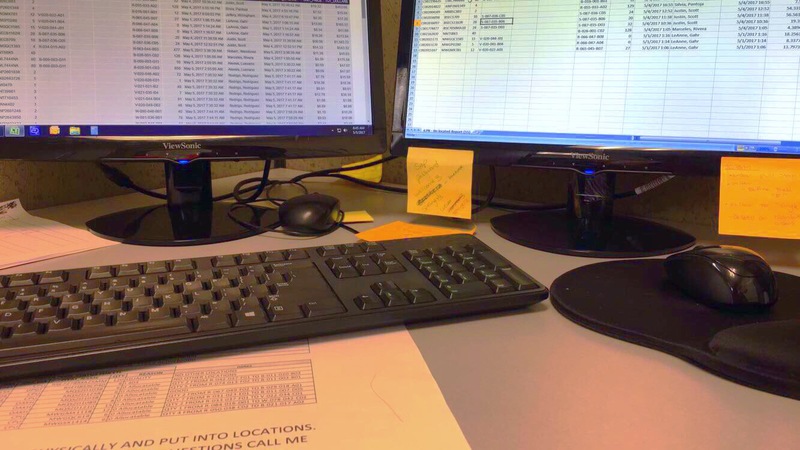 She has to put up with other departments bugging her for inventory issues. I swear, I couldn’t get started on my own work without being interrupted by other people with negative locations. At first I felt good that I was needed. But then I saw that it was a little overwhelming. I don’t know how she does it. Our inventory manager said I did a good job today which made me feel a little better. Then again I don’t know if she was serious or just being nice. Monday she won’t be around so that will be another day to show people my skills. And hopefully she’s back on Tuesday. Even though I do like the job, I’m still not getting paid what she is so why should I do it? This chance did provide me with a fifteen minute spotlight so management can see that I am useful. My work permit has yet to come. It’s really frustrating. It’s stressing me out so much. My back has been aching for more than three weeks now an I think it’s because I’ve been really stressing out. I called to check on my status and they told me it’s still in process. Which technically isn’t bad but I would like it to get here before June and before I get fired and my currant permit expires. One thing that did surprise me was that an old friend texted me and told me to right her a recommendation letter. I was a manager at a fast food place when I met her. It’s strange how that’s what made her text me. She only needed me to her convienoence. It kind of hurt my feelings but I’ll do the letter anyway. My big heart won’t let me be mean to her. I have to learn to forget and forgive. So much is going on right now that just adding enemies to the list of things isn’t going to help anyone out. Tomorrow should be a better day. I’m going to start it off with a hike, then I’m going to get an oil change followed by a hair cut. In the afternoon I’m going to see Gardiams of The Galaxy 2. I loved the first one, and even though I’m not as a big fan as my brother is of Marvel, I still loved it. So tomorrow shall be a better day and today shall end soon. But what does the rest of my future have in store for me? Yesterday was really hectic. I had so many things to do the day seemed never-ending. I woke up like any other normal day (and that says something because my days are anything but normal).I felt comfortable in my bed watching TV then I remembered I had to be somewhere. I had less than twenty minutes to get ready, drive, and be there. I had to be at my insurance (State Farm) because they refinanced my car, so now I will be paying it off way sooner and they provide free GAP Coverage (thank you). After that I had to drive to Car Max to cancel the GAP Coverage I had with them. Hopefully I get some money back, that would be more than nice. 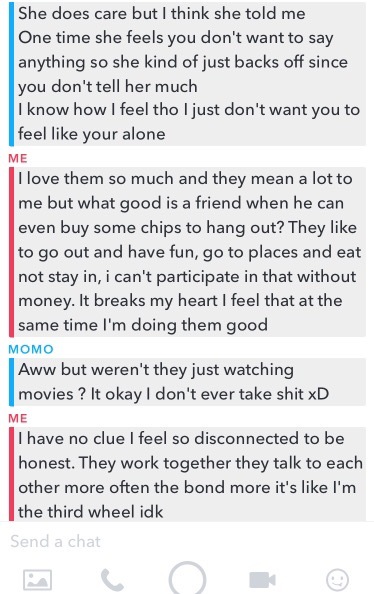 Mean while I’m busy doing all that stuff I’m also messaging one of my friend’s (we call her Momo, and I met her at my old job we literally only hanged out a few times but when we talk we just get each other, like we talk to each other every day). 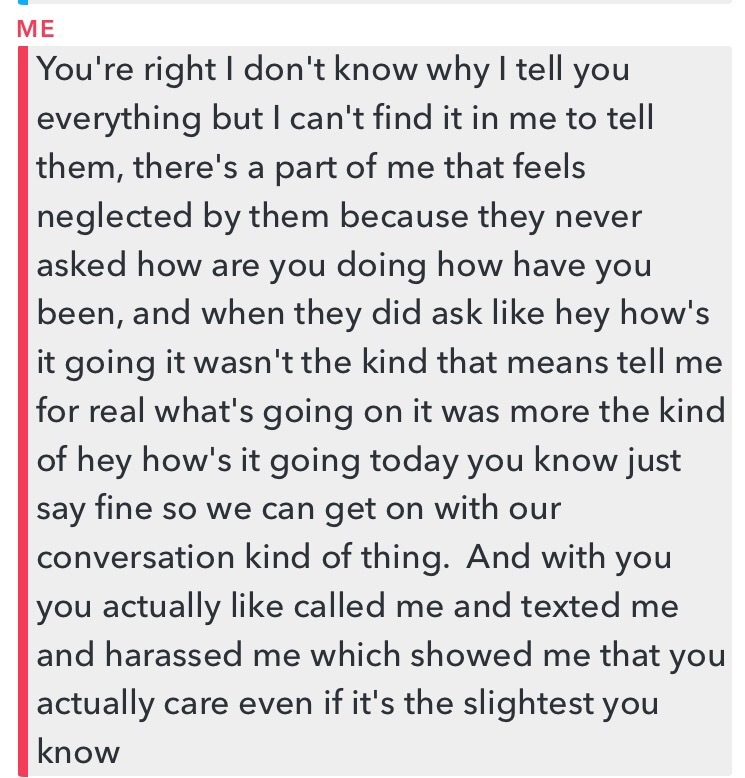 I was telling her how I stood up my other friends (the ones which I actually do or did hang out with). I felt horrible for not going and not even letting them know that I wasn’t going to show up. She told me to just tell them. To call them and explain whats going on. But I just can’t. Its different. I told her over the phone that when I talk to her she understands what I’m going through at least tries to, but with them, well one of them (Jen) she listens to what I say but then brushes it off like it’s no big deal. She changes the conversation so we don’t have to deal with my problems. That’s not what friends do. They help you find solutions. They don’t tell you that “its going to be ok” and then start talking about their favorite anime show. It’s sad because I love them with all my heart but who wants a friend that never has money to go out? Who wants a friend that is always complaining about their problems? They always like to go out. They have Disney annual passes! And I’m over here barely making my monthly car payments. Like, who wants to hang out with a person that can’t even afford the dollar menu? That problem isn’t salved yet, but at least I went to renew my work permit and everything is looking like its going to be approved (thank god). After that I agreed to go to Mount Rubidoux every Saturday. One of my church friends said he’d join in for moral support. Yet he still eats out with his family. This is my fight any ways right? Side note, my mom went out with her ex-boyfriend last night. I don’t know what to think about that. She said its just a friendly dinner. Yet, she cam home with new clothes and a bottle Brandy. Things in my life can not be any more complicated. (Jinxed that). Anyway, this Journal entry is just a mess. I don’t even know what half of what I said was but there you, you’re welcome.